Welcome to the second edition of Teacher Tuesday, where I match one of my books to a year level, and offer some activities for sharing the book in the classroom. 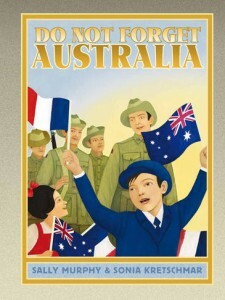 This week I’m focusing on one of my picture books: Do Not Forget Australia, With the centenary of the Battle of Villers-Bretonneux to be marked on ANZAC Day 2018, this is a good time to connect with this book if you haven’t yet, or to revisit it if you have. Blurb: Henri lives in the French village of Villers-Bretonneux. Billy lives in Melbourne, Australia. These two little boys, who live thousands of miles away from each other, share one story that unites Villers-Bretonneux and Melbourne in history. Before Reading: Make predictions on time period and setting of the book based on title and front over. 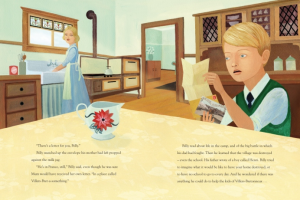 During and After Reading: Focus on aspects of text and illustrations which show that the book is set in 1918 – including colour palette, clothing, transport, communication methods. Questions: Why can’t the two boys meet in person? What is the connection between Henri and Billy? Use internet sources (such as The Schoolhouse Museum) to compare school life today with that of 1918. Create a table which compares aspects including classroom setup, size of classes, subjects taught, school attire, school rules, stationery used and more. After Reading: Discuss why the author might have chosen to use two viewpoints rather than one? Why use third person voice rather than first person? Why tell a war story from the viewpoint of children rather than from, say, a soldier, or adult from the village.? In Groups: Each group to work through the text, focussing on how we learn what the adults are feeling. – half the groups to focus on Billy’s Dad, the other groups on Henri’s Mum. Report back and discuss. Writing: Tell the story from the point of view of one of the adult characters OR in the first person voice of one of the children. Write the postcard that Billy receives from his father. There is a printable stencil for this activity HERE. Recap: From reading the story, what do students know about the battle of Villers-Bretonneux and the rebuilding of the school? Give students a blank table, or have them create one, with three columns: Story, Back of Book Notes, Video. Provide some subheadings: Dates, Key Events etc. 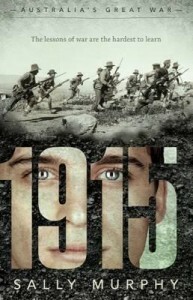 Have them note what they know about the key events of 1918 from the fictional story. Then read the back of book notes, with students using the second column to note any new facts. In groups, students can then examine the back of book notes themselves and add any facts they may have missed. Lastly, have them watch a video about the events – there are several on Youtube, including this one , which is made by a young researcher. Again, have students complete the table. Discuss: Which source provided the most information? Which was the most entertaining? Which one helped them to connect with the people involved? Writing Ideas: Write a recount of the events of the battle of Viilers-Bretonneux, OR the destruction and rebuilding of the school, using notes. Art: Experiment with using different colour palette for different moods and time periods. Mostly, I’d love to remind you that while I love to see my books used in classrooms, I also love to see kids just enjoying them. Reading a book should be pleasurable – whether it’s being used in the classroom or not. So allow your students to enjoy reading Do Not Forget Australia.